Since people know I work for Google, I get lots of mail from folks with odd questions, or with complaints about some Google policy, or questions about the way that Google does some particular thing. Obviously, I can’t answer questions about Google. And even if I could, I wouldn’t. This isn’t a Google blog; this is my blog, which I write as a hobby in my free time. hits on my work, and my hobby. And that’s the idea of scale. Scale is computer-science talk for how things change as they get bigger. In particular, I’m talking about the scale of information; the amount of information that we use on a daily basis has increased dramatically, and the amount of dramatic, fundamental change that has resulted is both amazing, and amazingly unnoticed by most people. This entry was posted in Computation on November 24, 2008 by markcc. I’ve been trying for a couple of weeks to put together a couple of interesting posts on the cryptographic modes of operation for confidentiality and integrity, and I just can’t do it. I’m finding it boring to write about, and if it bores me to write it, I know there’s no way that it’s going to be engaging to readers! So, I’m going to move on. I’ve explained the basic idea of the message authentication code as an integrity check, and I’ve described one simple way of integrating it into a common mode of operation. If you’re really interested in learning more, I recommend Bruce Schnier’s book on cryptography, which has ton of material on modes of operation and protocols, how they work, and how they can fail. Meanwhile, I’m going to move on to something that doesn’t bore me to write about, and therefore hopefully won’t bore you to read about: asymmetric cryptography, also commonly referred to (although not entirely accurately) as public key cryptography. 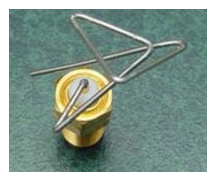 This entry was posted in Encryption on November 20, 2008 by markcc. Hawkwind, “Masters of the Universe”: Great bit from the early days of psychadelic/progressive rock. I’ve got recordings of both the live and the studio versions, and I vastly prefer the studio. player; he was one of the original flutists in Lunasa. But he did this album, which consists of vastly overproduced and overly up-tempo Irish music played against an electronic drumbeat. It’s just awful, and it’s a shame because if you could get rid of the electronics and the ridiculously overdone reverb, there’s some nice playing hidden in there. Still, I’ve never bought another of his albums after this. Peter Schickele, “Listen Here, Tyrannosaurus Rex”: a silly little song which Schickele actually takes credit for in his own name. Probably because it’s not quite awful enough to be credited to PDQ Bach. two dollar tin-whistle. No fancy arrangements; he plays it slowly – a reel at only about 70 beats per minute; very sparse tasteful ornamentation – and when you listen to it, you’ll understand why these tunes have lasted so long. Kansas, “Byzantium”: Quite a contrast from the last one. This is recent work by Kansas. It’s beautiful; things like this make me glad that they got back together. It uses very middle-eastern chords and melodies, and if I’m not mistaken, some middle-eastern instrumentation. It’s really quite lovely. Jethro Tull, “Black Satin Dancer”: Mediocre Tull tune. Nothing special. The rest of the album is great, but this isn’t a particular good song. beautifully written, and performed with incredible virtuosity by all involved. Igor Stravinsky, “Three Pieces”: Stravinsky is one of the greatest composers of the 20th century, and probably of all time. This is a very delicate, intricate chamber piece. chops; and some of his most compelling playing is on leisurely tracks like this. This entry was posted in Music on November 14, 2008 by markcc. Americans have no real knowledge or comprehension of numbers or mathematics, and what makes that even worse is that most really, truly, fundamentally don’t care. by the US navy in waters inhabited by whales. This entry was posted in Uncategorized on November 13, 2008 by markcc. It’s always amusing to wander over to the Discovery Institute’s blogs, and see what kind of nonsense they’re spouting today. So, today, as I’m feeling like steamed crap, I took a wander over. And what did I find? High grade, low-content rubbish from my old buddy, Casey Luskin. Luskin is, supposedly, a lawyer. He’s not a scientist or a mathematician by any stretch of the imagination. There’s nothing wrong with that in the abstract; the amount of time we have to learn during our lives is finite, and no one can possible know everything. For example, I don’t know diddly-crap about law, American or otherwise; my knowledge of western history is mediocre at best; I don’t really speak any language other than english. I know some physics, but my understanding of anything beyond the basics is very limited. Even when it comes to the topic of this blog, math, I’m at best an enthusiastic amateur. ignorant, but pig-ignorant. It’s a foolish kind of arrogance, where you believe that you know as much as people who’ve spent years studying something, even though you’ve never even read an elementary textbook. It’s like the dozens of people who’ve emailed my “disproofs” of Cantor’s theorem, when they don’t actually know what “cardinality” actually means. In this instance, Casey is annoyed because a group of people at NASA used evolutionary algorithms to create a better antenna. This entry was posted in Intelligent Design on November 11, 2008 by markcc. what’s called Lo Mein in the US, except that it’s actually authentic. be a bit of a problem, because they’re typically not well-labelled in english, but they’re well worth the trouble. garlic, fermented brill-shrimp, and oil. 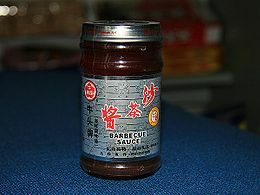 It’s usually sold in small glass jars, labelled “barbeque sauce” in english. It’s a dark paste, which has red chili oil floating on top of it. Thanks to a commentor, a picture of a jar of the brand I use appears to the right. The other is the noodles. The typical lo-mein noodle is a sort-of square-profile yellow egg noodle. 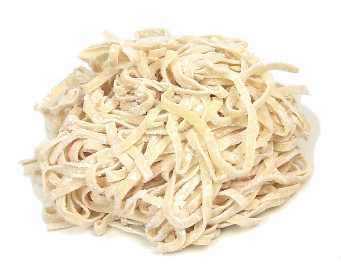 Shanghai Shu Chow Mien uses a plain flour noodle, which is thicker and wider – the noodles are between 1/4 and 1/2 an inch wide, and they’re a sort of pale-tan white. They’re sold fresh in the refrigerator case, not dried. They’re usually labelled “shanghai noodles”. Thanks to Google, you can see a picture of the kind of noodles I use to the right. This entry was posted in Recipes on November 7, 2008 by markcc. Sorry about the abrupt end to the liveblogging last night; Firefox crashed, and CoverItLive wouldn’t let me log back in as the moderator. Anyway, it’s a good day to be a liberal. As you all know by now, it was Obama in an absolute landslide. He won by a huge margin in the electoral vote, and by a good margin in the popular vote. past a filibuster in the Senate. This means that we can expect to see a really dramatic level of obstructionism from the remaining Republicans in the senate. And based on various comments that he made, I think we can count on Holy Joe Lieberman to join in with the right-wingers in blocking the Senate from getting anything done. There are a few interesting things that I wanted to comment on. This entry was posted in politics on November 5, 2008 by markcc. I’m going to be liveblogging the elections here starting at 7pm. I’ll be doing my best to track the results as they come in, and what they mean. Feel free to come join in. This entry was posted in Chatter on November 4, 2008 by markcc.